This easy sweet potato pie recipe is sweet, delicious, and is truly reallyeasy to make. It is gluten free and dairy free too! Who doesn’t love an easy sweet potato pie recipe?! 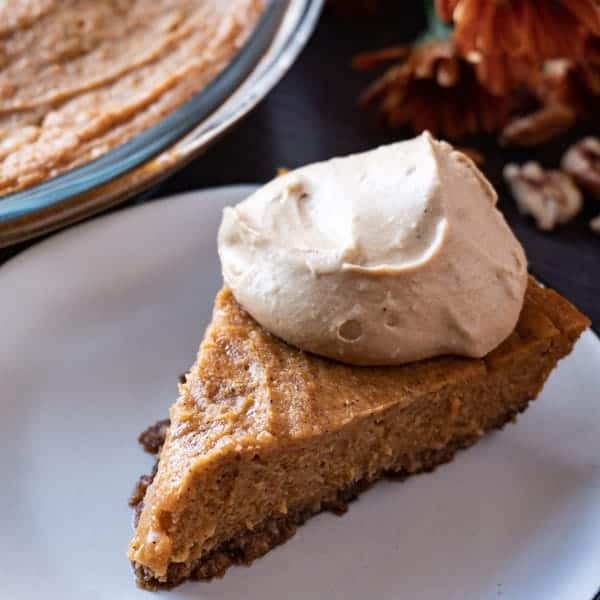 An easy sweet potato pie that is perfect to bring to large holiday meals since it is allergy friendly to those with gluten and dairy sensitivities! I have a handful of friends who can’t have dairy or gluten and so every now and then I’ll try to come up with a recipe that works for them. 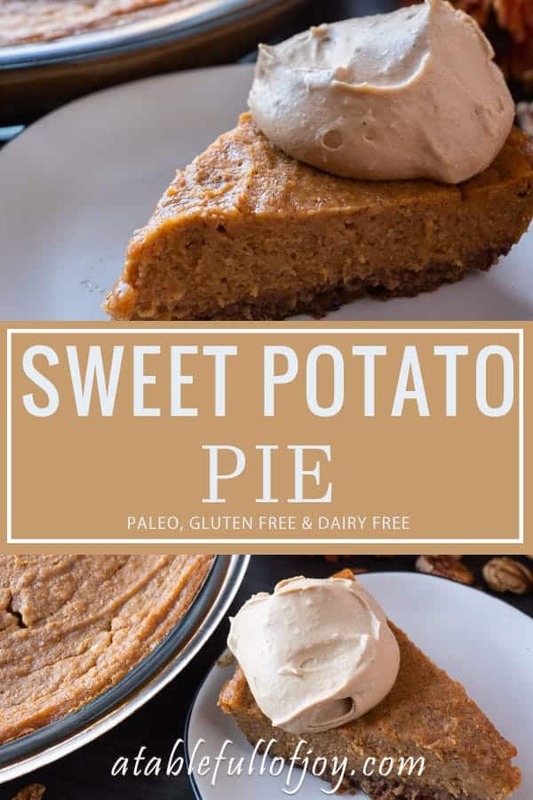 I’ve made some delicious sweet potato cupcakes, a chicken and spaghetti squash casserole and now with the holiday season upon us I thought this sweet potato pie recipe would be perfect! 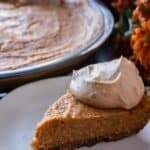 A simple sweet potato pie recipe that anyone will love! How do you make homemade sweet potato pie? Bake for another 45 minutes or until the pie is set! How do I make sweet potato puree? To make sweet potato puree preheat oven to 425°F. Wash and dry a medium sized sweet potato. Using a fork poke holes in it then wrap in foil. Bake in oven for 45-60 minutes or until fully cooked and squishy. Let the sweet potato cool and then peel it. Put it in a food processor and blend until smooth. I recommend eating within 3-4 days of making. Do I need to refrigerate sweet potato pie? Yes, after it has cooled to room temperature (1-2hrs) refrigerate it until you are ready to eat! An easy and delicious sweet potato pie recipe everyone will enjoy! 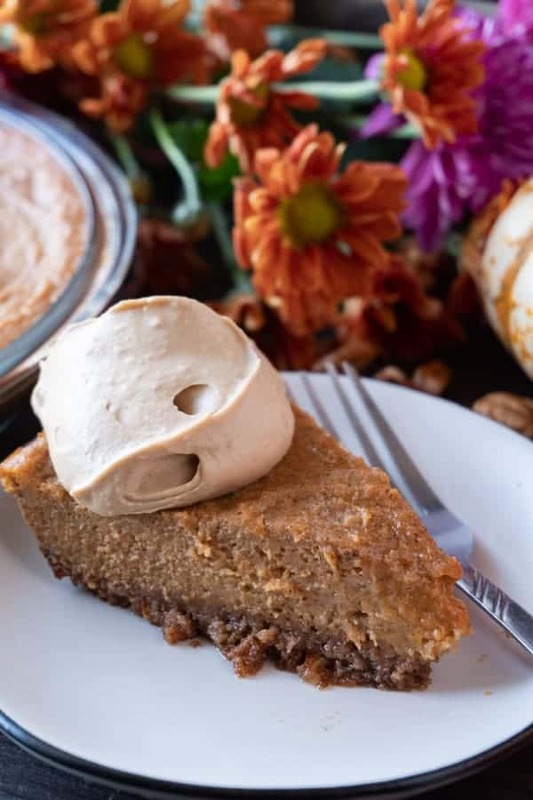 A delicious gluten and dairy free easy sweet potato pie recipe! Easy to make and even easier to eat! ¼ cup white sugar or coconut sugar works too! Preheat oven to 350°F and grease your pie dish with coconut oil. In a food processor combine pecans, almonds, sugar and vanilla. Once combined add egg and tapioca flour and continue to process until well combined. Press the crust mixture into the bottom of the pie dish. While crust is baking combine all the ingredients for the filling. Once the crust is done pour the filling into the dish and preheat your oven to 400°F. Bake the pie for 10 minutes at 400°F, then reduce the temperature to 325°F and bake until cooked through, about another 35-40 minutes. In a stand mixer or using a hand-held mixer with the whisk attachment combine all ingredients. Whisk on high until mixture is fluffy. If you use coconut sugar for this just know it will make the whipped cream orangish (like in the pictures). * If you are making your own sweet potato puree you will want to plan ahead since it adds about an hour of time to the pie making process. To make sweet potato puree preheat oven to 425°F. Wash and dry a medium sized sweet potato. Using a fork poke holes in it then wrap in foil. Bake in oven for 45-60 minutes or until fully cooked and squishy. Let the sweet potato cool and then peel it. Put it in a food processor and blend until smooth. Alternatively, you could use canned sweet potato for this recipe.